1. Outdoor Outdoor advertising methods allow you to place your brand messages at strategic places where potential customers can see them on a daily basis. You could place ads on buses, benches, hoardings, taxis and benches. 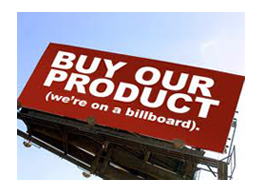 You can launch, re-launch or build a brand image for sustained brand awareness using outdoor advertising methods. 2. Promotions This method includes getting your logo or message imprinted on giveaways such as quality promotional mugs, pens, and caps. You can have them distributed at tradeshows, fundraising events and conferences. This form of advertising also includes sending coupons, fliers and direct mails. You will be able to establish customer loyalty as customers are more likely to purchase products from you again. 3. Print advertising People find newspapers, magazines and booklets engaging to read and that is the reason print advertising is one of the popular forms of advertising even today. The costs of print advertising vary greatly and it depends on publications, circulations, insertions and quantities. The best way to reach out to every corner of your target demographic market is to utilize these channels to ensure steady flow of revenue and new customers.